Today my youngest daughter, Eliza (the newborn on the right), graduated from her elementary+middle school of 10 years and will be entering a new high school in the fall. Two days ago, my oldest daughter, Taylor (peeking out on the left), graduated from high school and will soon embark on a Gap Year before entering college. Their sister, my middle daughter Cameron (center), wasn’t present for either of these milestones. 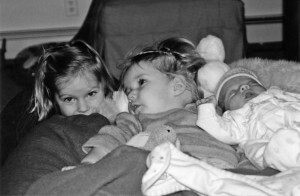 She died of a genetic illness at the age of two, 14 years ago, when Taylor was four and Eliza was ten weeks old. I thought about Cameron at both graduation ceremonies but not because I felt she was missing and should be there for her sisters. I thought about her because I felt she actually was there, in her sisters. Eliza sleeps with a photo of Cameron under her pillow, and she experiences Cameron as a guardian angel watching over her. Taylor currently plans on becoming a pediatrician so she can work with families whose children are healthy and families whose children are sick. Cameron also lives on in her parents. Her father, Charlie, learned guitar during her illness and finds happiness and peace when he is playing new songs in our back room. I know he feels Cameron especially when he is playing. And I have founded Courageous Parents Network as a way of connecting with and empowering parents whose children are currently living with serious illness. Courageous Parents Network is how I have made meaning of Cameron’s life and that of her beautiful cousin Hayden who had the same disease. It is my greatest hope that it helps parents, currently on this journey with their child, get through and find meaning in their Here and Now. I invite you to watch my talk on the Why, What and How of Courageous Parents Network, delivered and recorded as part of CPN’s 2015 Social Innovation Forum award.